Why "localhost" is always refered in the emails sent by KMP? It happens that an email that contains a link to an article sent by KMP has URL that you cannot open. For example it has "localhost" or "127.0.0.1" as domain name. It is possible due to KMP doesn't have a hard-coded setting that has current domain name. Instead it detects the domain name each time on the fly. This allows you to simply move KMP to another domain, or use multiple domain aliases. When you send an email from a KMP page manually (e.g. 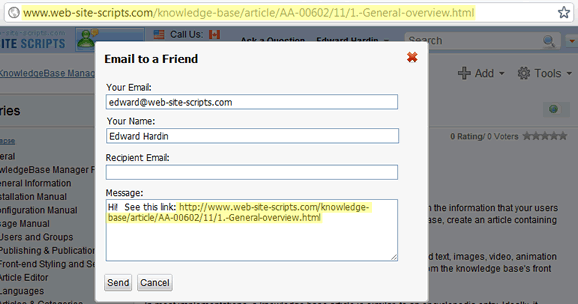 : via "Email to a Friend" form), it inserts the same hostname to the URL as one in the address bar of your browser. For example if you're sending an email from a page on web-site-scripts.com, it will have the article URL with "web-site-scripts.com" domain. The domain part of the URL is taken from the second parameter of the cron job command.